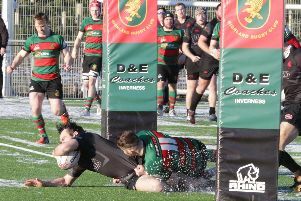 Tennent’s National Division 2 leaders Biggar made it a perfect five wins out of five with a dramatic 22-20 triumph at Whitecraigs on Saturday. Rowan Stewart opened the scoring for the visitors off an Orr pass after some good build up play by the pack. Renwick’s kick was missed so it remained 5-0. And it got better after a quick tap, when Davy Reive moved the ball left to Orr whose initial show and go broke the ’Craigs defence. His off-load found Lavery who crashed over for Biggar’s second try.The conversion was swept wide. The next score came after Moffat and then Voas had made good ground in the centre to push ’Craigs back into their 22. Though seemingly the ‘wrong’ way and in the face of ’Craigs’ numerical defensive advantage Reive moved the ball left to Lavery. The centre found Rowan Stewart who needed no second invitation to split the ’Craigs defence for his and his side’s second score. Once again however, three tries up but only 15-0 as the conversion was missed. Adair slotted a penalty for the home side before ’Craigs were then reduced to 14 men when centre Wamberg was shown a yellow for a high tackle. Biggar’s Carossi was sin binned in the second half and the hosts’ O’Neill soon bundled over for a try which was converted for 15-10. Another Adair penalty then put ’Craigs just two behind at 15-13. But Biggar reinforced their superiority when the returning Luhann Kotze set up Bradford to score a really opportunist try. To add insult to injury for ’Craigs, Matthew Stewart stepped up, and from the widest angle of all the kicks on the day, managed to slot the conversion for a 22-13 lead. Biggar skipper Alan Warnock was then shown a yellow card for stopping a play within the requisite 10 metres and so Biggar played out the match with just 14. Following this penalty and in the next foray ’Craigs’ number seven – villian turned hero?– drove over from close range. The conversion took the score to 22-20 in Biggar’s favour with five minutes remaining. Biggar survived late drama when Adair missed a penalty from virtually in front of the posts. Biggar return to league action this Saturday in a home encounter against Highland which kicks-off at 3pm.